Place noodles in a large bowl. Add hot water to cover; let stand 12 minutes or until tender. Drain. Combine ketchup, sugar, fish sauce, and pepper in a small bowl. Heat 2 teaspoons oil in a large nonstick skillet over medium-high heat. Add shrimp; sauté 2 minutes or until shrimp are done. Remove shrimp from pan; keep warm. Heat 4 teaspoons oil in pan over medium-high heat. Add eggs; cook 30 seconds or until soft-scrambled, stirring constantly. Add sprouts, green onions, and garlic; cook 1 minute. Add noodles, ketchup mixture, and shrimp; cook 3 minutes or until heated. Sprinkle with peanuts. Just fermented fish. Smells really bad, makes food taste excellent. I made this for dinner and my husband and I loved it! 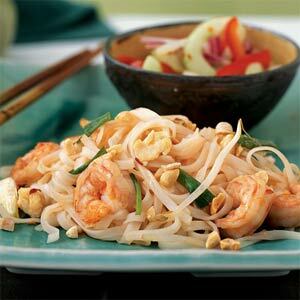 He asked that I keep this recipe in regular rotation since Pad Thai is one of his favorites! I couldn’t find bean sprouts and the two local grocery stores I visited so I replaced it with Green Beans and it was delicious! Erika, I love your site. What kind of sugar do you use? Brown sugar – turbinado, to be specific, or demerara, or coconut sugar, or maple syrup, or (in the spring time) honey. I don’t use much of it at all, either. It all just depends on what I’m doing.